With a new generation of game consoles on the horizon, people have had backwards compatibility on the mind. For those who want to play old games without keeping a ton of old consoles around, there's the Hyperkin Retron 3, which can play NES, SNES and Sega Genesis carts all in a single unit. This week, Hyperkin announced their newest console, the Retron 4, which is even more ambitious than the 3. (The 3 is pictured above.) 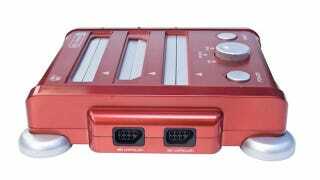 It'll add Game Boy Advance compatibility to the mix, as well as HDMI output. Nice. Given that the image up top is of the Retron 3, it's still not clear what the 4 will look like. Maybe something less candy-colored? Though hell, this thing could be bright green and orange and I'd still want one. Hyperkin says they'll announce more details about the Retron 4 at the Midwest Gaming Classic in March.